James Worgan (1715-1753) and Thomas Gladwin (c1710-1799) were both organists at Vauxhall during the 1730s and John Worgan (1724-1790) succeeded his brother as organist in 1751, as well as being director of the music for a year and an ‘in house’ composer. Both Worgan brothers were responsible for making the organ an indispensable part of Vauxhall’s music, and combined with the band, it typified the sound of the pleasure gardens from 1737 onwards. Handel and the Worgan brothers were all accomplished improvisers and keyboard players and Handel is widely attributed as remarking about John Worgan. ‘…he plays my music very well at Vauxhall’. 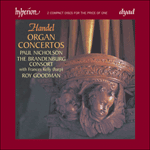 Organ concertos were very much a part of an evening concert. 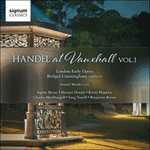 Handel’s organ concertos Op 4, HWV289–294, refer to the six organ concertos for chamber organ and orchestra composed by Handel in London between 1735 and 1736 and published in 1738 by John Walsh.